People living in Britain in 1939 saw many changes to their way of life when war was declared. 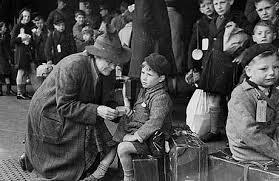 In the first four days of September 1939 nearly 3,000,000 people were evacuated in Britain. They moved from the towns and cities to safer places in the countryside. The vast majority of these were schoolchildren, but they were accompanied by 100,000 teachers and sometimes a parent. In scenes repeated all over the country, children marched as a school to the train station wearing identity labels and carrying their gasmasks and a few personal possessions. For most it was the start of a long day that would eventually conclude with their selection by a 'host family' in the 'reception area' - their new homes.